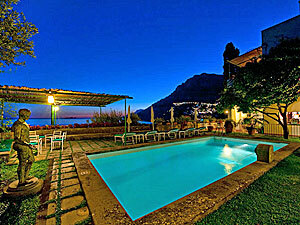 Just under 1 mile from the Amalfi Coast's most famous town of Positano, this villa is perched over the seaside. Completely private it has breathtaking views across the sweeping bay of Positano and Punta Campanella. Yet you are just 0.9 mile from the beaches, shops and restaurants of the famed Positano. From the main coastal road, you take the winding staircase of 130 steps and you reach the terrace and gardens. The terrace is filled with flowering potted plants, the gardens with shade trees, bronze wall sculptures and marble statue. A covered dining area has a marble topped wrought iron table ideal for breakfasts, lunches, dinners or just relaxing with family and friends and a good bottle or two of local wines. The air scented with the flowers, nearby gardens and salty sea. There are also lounge chairs for sunning, reading and relaxing. The beach is accessed by 120 steps leading down from the garden. This public beach is its busiest in July and August but those coming on other months will find it quiet. For those that do not want to walk down to the beach, you can relax at your private pool located just steps from the terrace. The spacious living room / dining room area have large French doors leading out to a private terrace with views of the sea. The large kitchen is fully equipped with 2 ovens, large cook top, and refrigerator freezer. The study with its two single beds can be converted into a bedroom with its own bathroom with tub. Off of the terrace is an independent bedroom with double bed and its own en suite bathroom. Pool side has another bathroom with shower for your convenience. The interior staircase leads up to the bedrooms where you have two large queen bedrooms each with fireplace, TV and Telephone. Both of these rooms have access to a panoramic terrace with breathtaking sea views. There are two marble bathrooms each with tub and separate showers. A beautiful terrace and garden surrounds the house where you can relax pool side or take the 120 steps down to a public beach. The scents from the potted flowers and lush gardens mingles with the breeze that always comes off the sea.